I found these red ones at Bloomies the other day and couldn’t resist. So gorgeous with the yellow stamens. Impossible to photograph though–so deep/dark/rich a color. I didn’t expose correctly, but these at least give you the idea, if not translate the true life brilliance. While I somehow seemed to have slept through ranunculus season, I think I’m doing a good job of enjoying peony season to the fullest. These tulips are HUGE! And very open. All of these flowers were a gift from my former employer at Bloomie’s up the street at Market Hall. 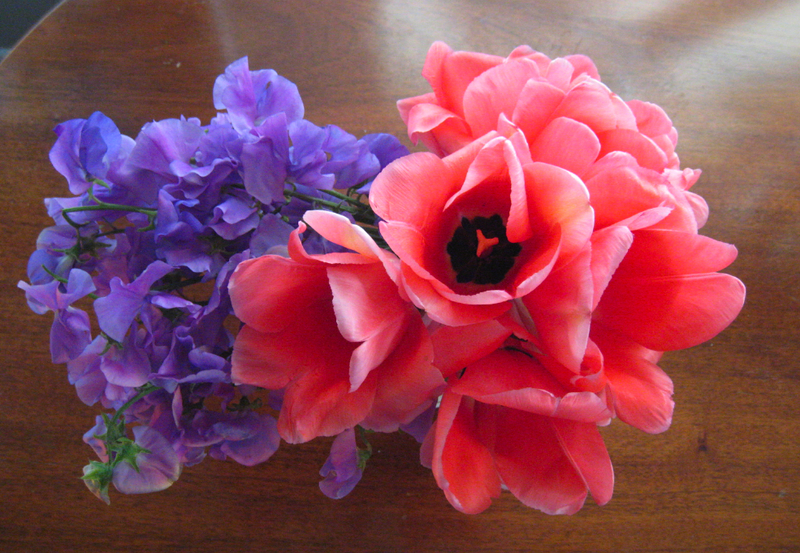 She said she bought the sweet peas just for their scent, because these bunches were especially fragrant. They are so amazing! So often you can barely smell the sweet peas that come out of florists, but not these; I feel like I’m smelling sweet peas for the first time! 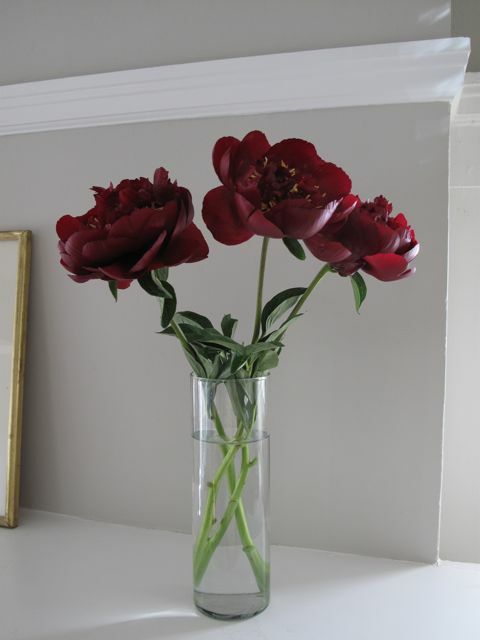 When I got them home I left each flower grouped in the bunch it came in because I love the strong color blocks–and I showed off the deep green of the smooth leaves and stems of the tulip with a tall clear mason jar. 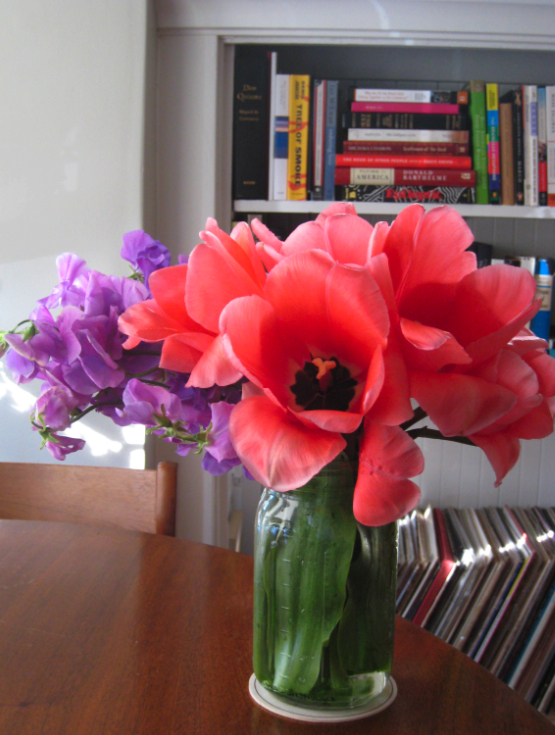 The scent revelation that these sweet peas sent me on led me to realize that the Soy Face Cream by Fresh that I sampled from Sephora (and couldn’t stomach the $42 for 1 oz.) 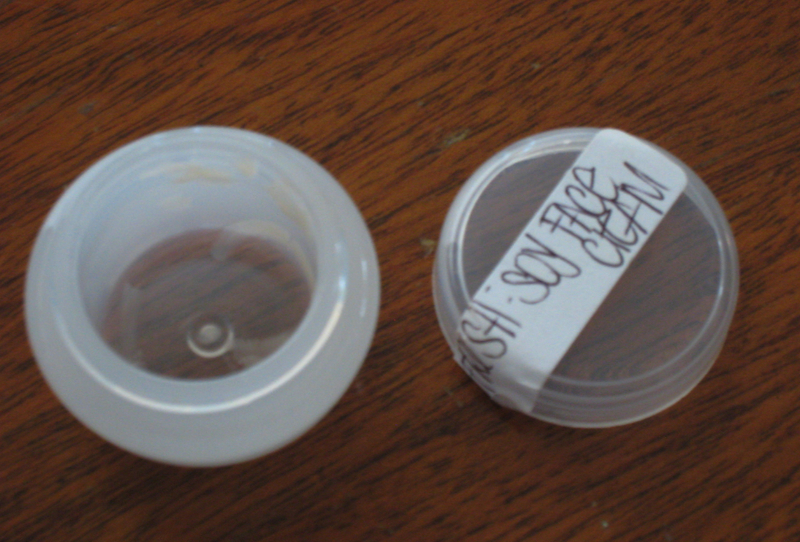 and have been scraping from the bottom of my sample actually smells literally of sweet peas. Sorry Fresh I don’t know where you got that soy scent, smells like sweet peas to me, but either way I’ll take it! I might actually have to throw down the $42. It’s just that good. Actual size of sample container. Note emptiness. The bouquet was arranged by Bloomies up the street at Market Hall. Didn’t they do a beautiful job? 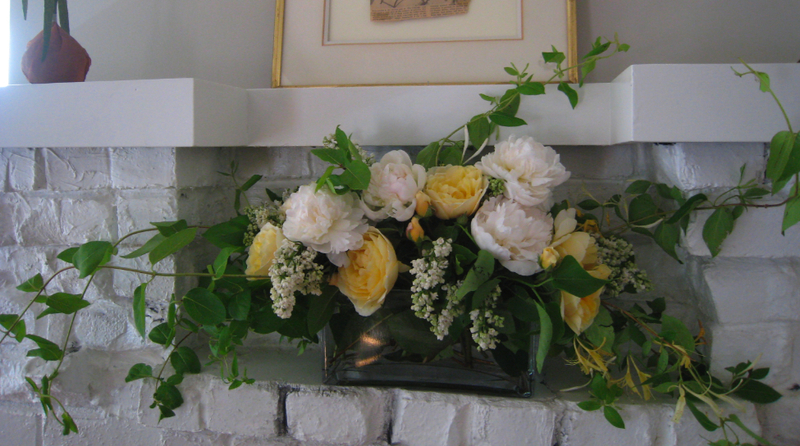 The roses are “fragrant fantasy”–they smell soooo good! It was this time last year that I began my career as a florist at Bloomies and discovered my intense obsession with flowers and floral design. It’s a sentimental time of year for that reason. 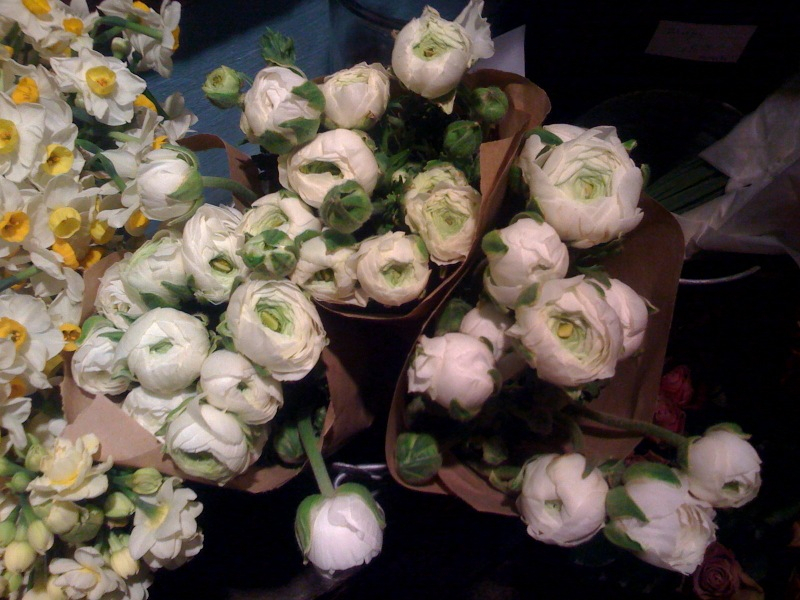 Right now, Bloomies is pulling in fresh from market all my late-winter early-spring favorites: ranunculus(! ), narcissus, stock, ornamental kale, hellebore, and the list goes on. It’s just heavenly over there. It’s a must visit–don’t forget to take something gorgeous and fragrant home! Honestly, white ranunculus are the most beautiful, chic of blooms. Maybe I just think this because they go really well with my small craftsman home decorated in neutrals, but either way. 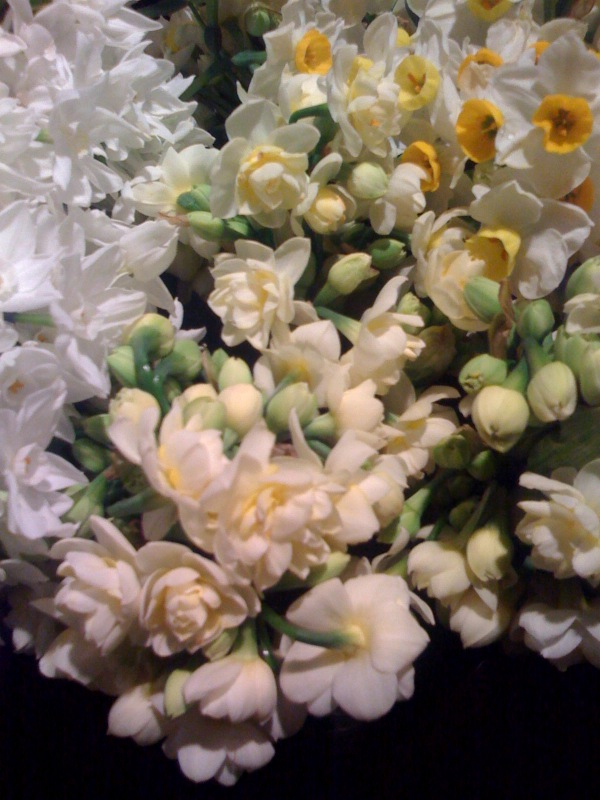 Here we have three different types of narcissus: the variety commonly known as paperwhites (far left), china narcissus, one of my FAVORITES due to the color and rose-like cluster of petals (center), and a scented mini-daffodil (upper right). This is another of my absolute favorites, and I’ll take it in any color (and it comes in many). 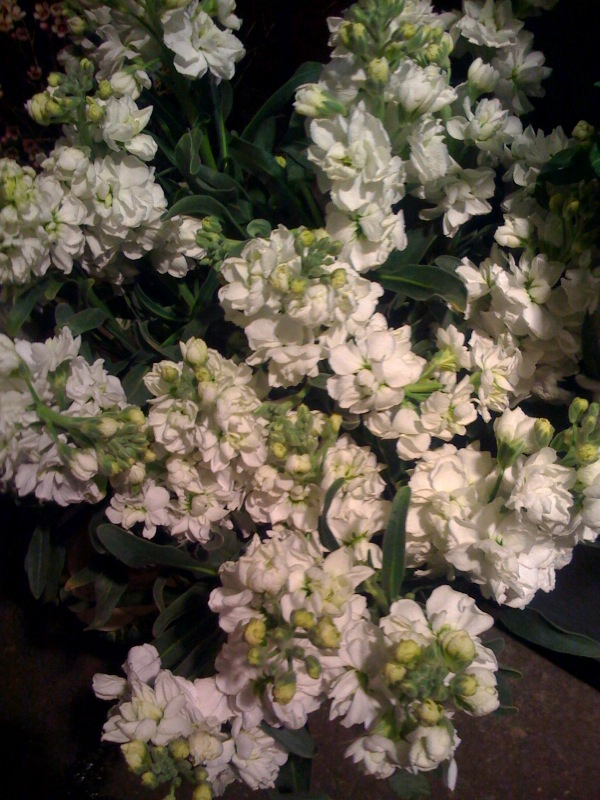 I love the delicate, clustered blossoms arranged vertically on the stem, and the soft, sweet scent. One of the best parts about these is that you can actually get them year-round and they are so inexpensive! Bloomies bases all their prices on the market, but these most often go for a dollar a stem. 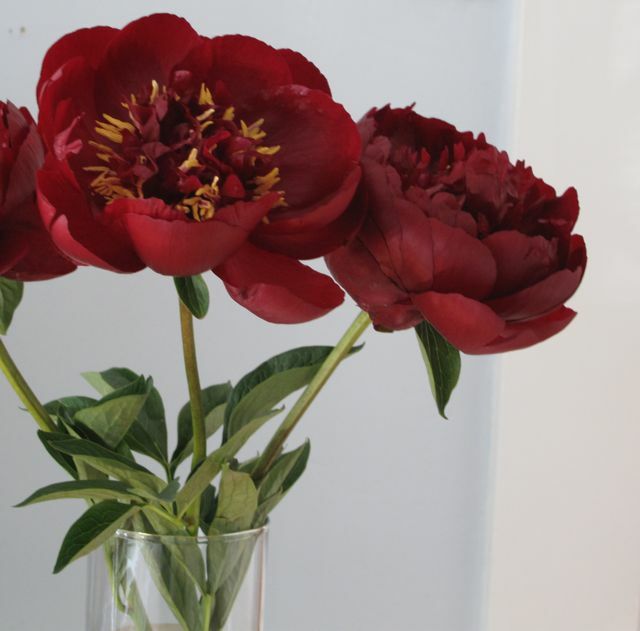 Gorgeous on their own or in an arrangement with other blooms. Go forth! And get Bloomied!